The information below has been gathered from anecdotal data available online, from discussion with families and from the limited studies available, with advice sought from Dr Jennifer Miller (Paediatric Endocrinologist at the University of Florida). It does not take the place of medical advice and we recommend parents consult with their child’s doctor or dietitian before using dietary supplements. It is also important to communicate information about ALL medications your child is taking to health care providers, including supplements, due to the possibility of serious drug interactions. Some studies of omega 3 supplementation in children have reported improvements in language, learning and hyperactivity. Parental observations have noted improvements in general health and aspects of behaviour, such as concentration. Results vary, however, with other studies reporting no cognitive improvements. There have been few rigorous studies into the cognitive effects of fish oil supplementation, and none involving PWS, but it is generally accepted that malnutrition can impair cognitive development. As some children with PWS may eat a low fat diet, it follows that they may have a deficiency of nutrients such as essential fatty acids, so omega 3 supplementation is advised. Dr Jennifer Miller recommends that all children with PWS should take fish oil supplements. She states that there are unlikely to be any noticeable clinical effects, but supplementation ensures that the brain is getting the essential fatty acids it needs for good myelination. Myelination, beginning in infancy and continuing into adulthood, is a process where a fatty layer (myelin) accumulates around nerve cells allowing them to transmit information faster. The human brain is not a fully developed organ at birth and maturation of brain regions and their connecting pathways takes place over time. There is also discussion amongst researchers about the role of omega 3 supplementation in adulthood for preventing stress and regulating mood. It is thought to be likely that the interactive effects of nutrients play a part in this and the effect of omega 3 alone is uncertain. CoQ10 is a vitamin-like substance and antioxidant found in meat protein, dark green leafy vegetables, beans and peas. It is essential for energy production which means that a person who is deficient in CoQ10 may feel less energetic, have reduced muscle function and a decreased metabolic rate. As people with PWS present with similar symptoms, this supplement has long been used by parents of children with PWS, particularly infants. To date, there is no scientific data supporting the benefits of supplementing CoQ10 in PWS, but there is much anecdotal data suggesting that for some, supplementation increases daytime energy, alertness, interactive expressiveness and even vocalisation. However, other parents find that supplementation has no effect. CoQ10 may only be beneficial for individuals with PWS if a deficiency exists. Two studies have examined CoQ10 levels in PWS via blood sampling. In 2003 Butler et al associated reduced levels of CoQ10 with obesity by finding no significant differences in levels of CoQ10 between subjects with PWS and obese controls, but there was a difference when compared to normal weight controls without PWS. In 2011 Miller et al replicated this study using larger sample groups but found no significant differences between the 3 groups. It is thought that plasma CoQ10 levels are an unreliable measurement which underestimates the prevalence of low CoQ10 levels in the muscle. Following the 2003 study, CoQ10 treatment normalised plasma levels, but no improvements were reported. After the 2011 study, 10 families trialled CoQ10 supplementation (50mg/day) with 5 reporting benefits in daytime alertness. Dr Miller questioned that as these children were under 3yrs, these changes may have occurred naturally. In clinical settings, Dr Miller has seen PWS patients present with low serum levels of CoQ10 who have improved with treatment and others who have not (assessed by parent questionnaires). In 2010 the PWSA (USA) published the results of a medical update parent survey and 64% of those who had commented on CoQ10 supplementation were either somewhat satisfied or very satisfied with results. Although not suggested that CoQ10 has the body composition and growth benefits of GH therapy, Eiholzer et al (2008) found that GHT and CoQ10 (2.5mg/kg/day) had equal effects upon psychomotor development in infants. We look forward to the results of the first controlled study examining the effects of CoQ10, currently being conducted by Dr Tein and funded by FPWR. Many families purchase a ubiquinone form of CoQ10 from Cyto-Med in the USA, but Dr Miller suggests that if families prefer not to buy from overseas, using an alternative softgel brand containing vitamin E will help with absorption. Doses vary from 1-30mg/kg/day in infants and up to 200mg/day in older children and adults. 100mg is usually sufficient in children to normalise CoQ10 levels if deficient. Trialling this supplement for a few weeks will reveal its effectiveness, but it is important to try only one supplement at a time to see whether or not they are working. If any side effects are experienced, such as irritability, the dose may need to be reduced. Carnitine is an amino acid and antioxidant which improves cellular energy metabolism. It is mainly found in animal products such as meat, fish and dairy foods and is rare in fruits and vegetables. In PWS it is reported to improve muscle tone and strength, as well as energy levels. Infants and children with Down syndrome, displaying PWS-like hypotonia and delayed growth, were found to have significantly lower carnitine levels. Animal studies have also revealed links between obesity and carnitine deficiency. As people with PWS present with physical manifestations similar to those of someone with carnitine deficiency, and the combination of lifelong obesity and restricted calorie diet create a higher risk of carnitine deficiency in PWS, many parents have independently started their children on this supplement. However, only one study to date has investigated carnitine levels in PWS. In 2011 Dr Miller et al found there were no significant differences in total and free carnitine levels between a PWS group and controls, but higher levels of carnitine esters and significantly higher levels of ester-to-free carnitine ratios were found in the PWS group compared to control siblings. This finding suggests that PWS may be associated with a defect in fatty acid metabolism in some individuals. Two individuals with PWS were found to have an abnormal ester-to-free carnitine ratio in addition to a low free carnitine level, plus elevations on acylcarnitine profiles, suggesting that there may be a small subset of the PWS population (approx 5%) who have a true secondary carnitine deficiency. Within the PWS group, free carnitine deficiency was seen in 17.5% and total carnitine deficiency was seen in 15%, indicating a possible functional carnitine insufficiency in some individuals due to either impaired carnitine metabolism or insufficient dietary intake. The study concluded that the subsets above may benefit from carnitine supplementation. Following this study, 20 families opted to trial carnitine supplementation (50mg/kg/day divided twice a day). Thirteen (65%) reported subjective improvement of exercise tolerance and daytime alertness, with 3 providing supporting documentation from physiotherapists who were unaware of treatment. The remaining families discontinued treatment due to lack of benefit or side effects. The 2010 PWSA (USA) medical update parent survey found that 84% of those who commented on carnitine supplementation were either somewhat satisfied or very satisfied with results. As yet, evidence supporting the benefits of carnitine supplementation is purely anecdotal. In PWS clinics Dr Miller prescribes prescription grade carnitine at 50mg/kg/day and recommends carnitine fumarate as the best substitute. The average adult dose is 1000mg 2-3 times daily. A side effect sometimes reported is loose stools, but reducing the dose can resolve symptoms. Carnitine in large doses can worsen side effects, so dosages should be divided into smaller amounts to maximise tolerance and uptake. B12 plays a role in the functioning of the brain, nervous system and in production of red blood cells. Anecdotal data indicates that supplementation can be good for improving energy levels in PWS, plus speech in some individuals. There are even reports of a reduction in appetite at higher doses. Natural sources of B12 are only found in meat and dairy foods such as shellfish, liver, fish, eggs, red meats and milk, but synthetic B12 is often added to foods like cereals. Unlike other vitamins, B12 has extremely low toxicity and excess levels are excreted or stored in the liver. B12 deficiency is relatively common and presents with many symptoms, including cognitive decline, poor memory, depression and fatigue. The prevalence of B12 deficiency in PWS is unknown and there is some uncertainty about the accuracy of blood serum testing with suggestions that levels could appear normal whilst absorption may be poor due to impaired cellular uptake. The restrictive PWS diet may put individuals at additional risk for B12 deficiency. Some side effects of B12 supplementation are hyperactivity, changes in sleep patterns and increased emotional sensitivity and assertiveness. Uneida Kincaid (author of website PWS Dots) explains that a child may experience an overwhelming period of ‘awakening’ after supplementation and undesirable behaviours may be transitory and diminish in time. She likens impaired energy metabolism to living life on a sedative which negatively affects emotional growth. Dr Miller states that there is no fixed per kg dose for this supplement as it depends on the level of deficiency which would need to be tested. Further studies are required into higher dose efficacy and safety. MCT oil is a medium chain triglyceride (fatty acid) which derives from coconut oil. It’s a relatively new supplement in the PWS world and is mainly used by parents who provide a modified Atkins diet for their child (a high fat and very low carbohydrate diet.) MCTs are saturated fats and are easily absorbed. Trace amounts can be found in butter and other full-fat dairy foods, but the richest sources are coconut and palm kernel oil. MCTs are sent straight to the liver where the body uses them for energy instead of storing them as fat, therefore increasing metabolism. In conjunction with a low carbohydrate diet, MCTs can reduce fat storage, help maintain a healthy weight, boost energy levels and increase satiety (feelings of fullness). However, if used incorrectly, they can cause weight gain. We should also add that any effects of long term use of MCT oil in PWS remain unknown. Families who have trialled MCT oil for PWS have observed benefits in energy and cognition. Some families report that their child has improved ability to focus, more lean muscle mass and reduced appetite. There are also reports of a reduction in seizures in some individuals with epilepsy. A major side effect of MCT oil is that it can cause gastric problems. It is necessary to begin very slowly with a very small dose, i.e. 1/4 teaspoon, and to slowly increase dosage as the body becomes able to tolerate more. It is also best to spread doses throughout the day. These are often used to improve gut health and the regularity of bowel movements because gastro-intestinal issues (such as slow digestion and constipation) are common in PWS. Prebiotics are found in plant based carbohydrates and act as food for probiotics, but a low carb diet may be lacking in prebiotics and the bulk fibre needed for good digestion. Probiotics are ‘good’ live bacteria found in fermented foods such as yoghurt, kefir, fermented vegetables, sour cream and soft cheeses. It is also believed that pre and probiotics may help with immunity, brain function, calcium intake, maintaining energy levels, regulating satiety and combating obesity. An improvement in cholesterol profiles has also been observed in some individuals with PWS. There is a growing body of scientific studies revealing links between gut microflora and obesity, with the microbiota in PWS being found to have similarities to that of non-PWS obese individuals. It is thought that adjusting the genetically predisposed gut microbiota in PWS could help alleviate metabolic deterioration in the same way it does in non-PWS subjects with food-induced obesity. Research comparing the gut microbiome in children with and without PWS is ongoing. There are also a growing number of early stage studies examining links between the gut microbiome and mood disorders, social behaviour and Autism Spectrum Disorder, with the suggestion being that the gut microbiome may influence neurobehavioural development and modulating the gut microbiota is therefore seen as a potential therapy for children with ASD. In 2016 researchers at the Baylor College of Medicine in Houston observed insights into the role of the microbiome through animal models of ASD. The offspring of obese mice during pregnancy exhibited social deficits and an imbalance of their gut microbiome, with deficiencies in certain brain characteristics, most notably a reduced ability to produce oxytocin. Adding a single bacterial member of the gut microbiome, L. reuteri (also a common human probiotic), was sufficient to reverse many of these deficits, including restoration of oxytocin levels and some of the social issues. They identified a number of bacterial types that were depleted in the ASD-like offspring mice, most notably the species Lactobacillus reuteri. The results echo those from a 2013 mouse study in which addition of another bacterium, Bacteroides fragilis, led to dramatic reversal of autism-like behaviours plus restoration of the gut microbiome. Anecdotally, many parents believe they were able to improve their child’s autistic symptoms by making dietary changes to improve gut health, but much remains unknown, for example, whether gut imbalances impact on brain functioning or vice versa, or whether the vagus nerve pathway between the gut and brain causes symptoms, or whether for treatment to be effective, it needs to be initiated before the critical neurological developmental windows when important brain regions mature and connect. There is also the possibility that behavioural improvements in children with ASD are seen because an improvement in gut health provides relief from the discomfort of gastro-intestinal issues, also common in ASD. To begin to understand the potential interaction of the gut and PWS behaviour, further research is needed to first understand the variability of gut microbiota in PWS at different periods of development and within different genetic subtypes. Some dietitians recommend supplementing the PWS diet with a multivitamin and mineral to ensure adequate intake of essential micro-nutrients within a restrictive PWS diet. A low energy diet may be lacking in vitamins A, D, E, K and the minerals iron, calcium and zinc. A multivitamin and mineral may contain iron and some children with PWS seem to need supplementary iron. Vitamin C in the multivitamin will aid the absorption of the iron. A multivitamin and mineral may also contain zinc which is thought to be deficient in PWS. The body only requires a small amount of zinc so the amount available in a multivitamin and mineral should be sufficient. It can be dangerous to supplement with additional iron if a person is not deficient and excess zinc can be harmful. A doctor can easily test iron levels and may advise gentle iron supplementation. It is important to note that some vitamins can be toxic if given when not necessary or in excess. It has been observed that a deficiency of vitamin D and calcium is common in PWS, with the possibility of an additional risk of vitamin D deficiency if a person is obese. These deficiencies can play a role in the development of osteoporosis and a doctor may recommend supplementation. Vitamin D is necessary for the body to absorb and use calcium. Small amounts are found in foods such as fatty fish, eggs and fortified milk and cereals, but the main source is from exposure to direct sunlight and 10-15 minutes per day without sunscreen is recommended. Too much vitamin D can raise calcium levels beyond what is safe, leading to kidney stones and calcification of body organs and tissue. Calcium is found in dairy foods, seafood, leafy greens and legumes. It is important for healthy bone development in PWS because many individuals develop low bone mineral density during adolescence and adulthood due to hormone abnormalities. Supplementation should be divided into smaller doses spread across the day. A study by Dr Miller and Dr Angulo in 2013 found that PharmaNAC (N-acetylcysteine) improved skin picking behaviours in all 35 trial participants with PWS. It is now widely used to reduce skin picking and other similar, repetitive habit behaviours. N-acetylcysteine derives from the amino acid L-cysteine which is used by the body to produce glutathione. Glutathione is an extremely important and powerful antioxidant produced by the body to help protect against free radical damage and is critical in supporting a healthy immune system and respiratory system. Evidence also suggests that one of the contributing factors to obsessive-compulsive behaviours is disregulation of the glutamate pathway and it is believed that PharmaNAC restores balance to this important pathway, replenishing intracellular levels of the natural antioxidant glutathione. 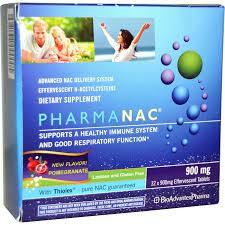 NAC is also used in the autistic community where abnormalities in glutathione pathways have been implicated. Dr Miller recommends the effervescent form, PharmaNAC, because it is absorbed well and the sealed sachets mean that it does not degrade through oxidisation with the air, causing it to become less effective. This form is not currently available in New Zealand but can be purchased from overseas. For many individuals with PWS, one 900mg PharmaNAC tablet per day is sufficient, whilst others may need two tablets per day to reduce picking, taken morning and night. Others may use 1/2 tablets, but the dose is not age or weight dependent. Minimal side effects of gastrointestinal upset are experienced by a small number of individuals. Vitamin C can be taken with PharmaNAC to maximise effectiveness and prevent the possibility of oxidised cysteine forming kidney stones with long term use. Zinc can also be supplemented as NAC increases the excretion of zinc and other minerals.